You may also download a PDF version of this document by clicking here. Block Engineering's LaserWarn™ sensor is a real time, open path mid IR chemical analyzer. LaserWarn uses patented next generation Quantum Cascade Lasers (QCLs) to detect chemical threats, leaks, and fugitive emissions over thousands of square feet. Utilizing eye safe lasers, this instrument has both indoor and outdoor applications such as fence-line monitoring or an environmental safety tripwire. LaserWarn operates continuously in the mid infrared to deliver real time chemical identification and quantification of fugitive gases in less than 1 second. As shown in this Application Note, LaserWarn can detect acrolein leaks at concentrations of around 1 ppm. Acrolein, or propenal (CAS# 1107-02-8: C3H4O), is an unsaturated aldehyde produced by burning of oils and fats. Acrolein has two important industrial uses, as a chemical precursor and as a powerful biocide. Acrolein is largely produced to synthesize acrylic acid and DL-methionine: an important amino acid used as an industrial feed supplement. Acrylic acid is a key component in plastic and polymer chemistries necessary to manufacture plastics, coatings, adhesives and other paint-type compounds. In other applications, acrolein is used by oilfields and irrigation channels as a powerful biocide. It is effective at mediating algae, mollusks, bacteria, and other living species found in processes that require water recirculation such as cooling water towers, water treatment ponds, irrigation channels, surface equipment, water injection systems and injection wells. Specifically to the oil and drilling business, bacteria can be destructive to drilling efforts due to H2S formation by sulfate reducing bacteria metabolism, biofouling, iron sulfide scaling, microbiological driven corrosion, formation face damage and contamination of feedstock from sulfite generation. Acrolein is a powerful solution to these problems since it not only is oil-permeable and biofilm permeable allowing easy mitigation of bacterial colonies at the site, but it also acts as a H2S scavenger and an iron-sulfide dissolver. Because acrolein is so widely used in the oil drilling and other industries it poses significant health and safety risks. Acrolein is classified as a severe poison, severely flammable, extremely corrosive, possible human carcinogen and a potential peroxide former. Despite the dangerous nature of this chemical, the benefits outweigh the risks of using acrolein in industrial settings so preventative measures have to be implemented to reduce employee exposure. To date OSHA states that the total permissible exposure limit (PEL) should not exceed 0.1 ppm total weighted average (TWA) or 0.3 ppm for short term exposure. In order to comply and keep workforces safe from this toxic chemical, industries need to find reliable monitoring systems. LaserWarn offers a solution to open-path fence-line monitoring with the ability to detect chemical leaks in real time. This real-time analysis can be used to alert workers to immediately leave the targeted area as well as supply important information needed to resolve and fix the leak. 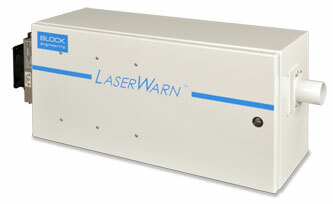 LaserWarn utilizes patented QCL lasers capable of scanning the mid infrared region to create an open-path mid IR spectrometer capable of identification and quantification of complex chemical species. The QCLs contained within the LaserWarn system produce continuous spectra of all chemicals detected within the monitoring path and spectral range of the system. The spectra collected is then analyzed using proprietary algorithms embedded within the control electronics of the machine. The results are displayed to the user as an easy to read quantification of all chemical species present in the currently monitored environment. The LaserWarn chemical monitoring system is configurable in either an indoor or outdoor setting depending on application requirements. For outdoor monitoring the system is enclosed within a NEMA enclosure, capable of temperatures between -40° and 50° Celsius and is self-contained within one box (10"x 37" x 14" LxWxH). The LaserWarn emits a laser capable of a 500 m stand-off distance to a retro-reflector mirror for a total monitoring length of 1 km. The LaserWarn communicates directly with a Digital Control System (DCS) over Modbus via TCP/IP or using a Google Chrome GUI. The analyzer is able to communicate to a local alarm system via a Modbus command when a certain concentration threshold is reached. The analyzer itself does not have an internal alarm system but it does have the capability to communicate and trigger an alarm at the installation site through a Modbus communication register. Each system is designed with an application specific library of detectable gases (contact Block for your individual gas monitoring needs). The system, once aligned, is ready for continuous 24/7 monitoring. Each system is also equipped with an internal adjustable polystyrene reference, beam control electronics for remote beam fine tuning, and a fillable gas cell for other referencing needs. The system is factory calibrated but a reference is necessary to adjust they system to account for changes in humidity and ambient air changes. The polystyrene and gas bump cell are used to monitor and evaluate the internal reference but are not necessary for daily monitoring purposes. LaserWarn is designed with unique software that displays real-time spectra of all detected chemical species as well as quantification for each detected analyte. Each unit is supplied with a custom library of 5 gases specific to each customer's needs and is field upgradeable. 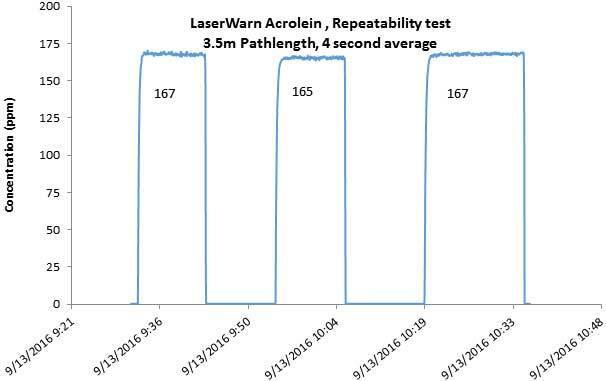 To test responsivity and effectiveness of LaserWarn's ability to monitor acrolein the system was validated at Block Engineering in Marlborough, MA. Using a permeation tube, different amount of acrolein was monitored and tested using the QCL mid-IR laser spectrometer system. The experimental setup had a permeation oven at the ideal temperature specified by the tube manufacturer. A fixed flow of nitrogen was passed through the oven at a steady status to ensure consistent release rate. 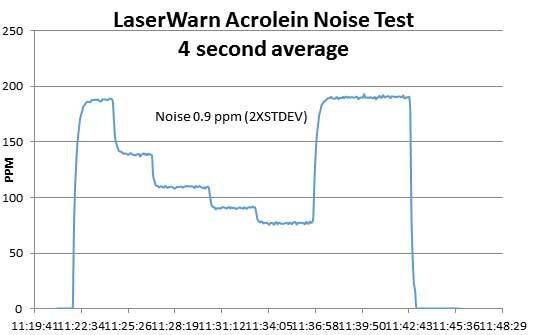 The above LaserWarn data shows a ~1% error associated with repeatability. This measurement was performed in triplicate to eliminate any sort of experimental bias. It was also demonstrated that the system is able to detect immediate introduction of the acrolein. Due to the toxicity of acrolein, the test was performed in a cell and the t90* time was determined to be 28 seconds with a 4 second average. The response timing and averaging was direct related to the delivery system, not the performance of the instrument. In the field, this number is not relevant, but for experimental design and competency of the model, the software was able to record the accurate saturation of the cell within 7 sample scans (28 second measurement with a 4 second scan interval). This number shows the design of the experimental cell and gas chamber is reliable and has reached a steady state. The steady state measurement of the gas cell and chamber is important to ensure that all data recorded is consistent and experimental error is minimized. 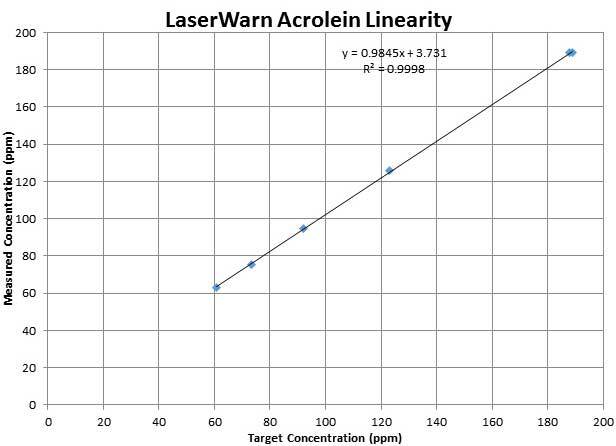 The data shows a very linear correlation between the LaserWarn detection and response to the changing acrolein concentration. The R2 value supports the fit of the line and the accuracy of the repeat measurements. Each measurement was taken over 5 minute intervals. The permeation system was set at a steady state and the sample line was diluted with extra carrier N2 gas. By diluting the system post-sample delivery system we were able to limit noise from a varying permeation system and the noise can be directly correlated to the detection system. After taking a timed average and standard deviation for each concentration change it was noted that the average standard deviation is less than 0.5 ppm and the noise on the system is approximately twice the standard deviation: below 1 ppm. With a low standard deviation and low noise, the LaserWarn system can detect changes in concentrations, above the detection limit, less than 1 ppm. In conclusion, the LaserWarn system is capable of making fast, repeatable and precise measurements of acrolein. This study supports the use of LaserWarn as a fence-line monitoring option for fugitive acrolein emissions and leak detection. * t90 is a measurement of the response of a system. Gas detection is often an exponential concentration increase; therefore, the t90 is a measurement that describes the response time of the system necessary to detect a 90% of the expected concentration. If you would like to discuss how the LaserWarn can help with your application needs, please contact us.